This first resolution on protecting our immigrant students and members was raised on behalf of MORE and Teachdream by Mike Schirtzer our representative on UFT Executive Board High School Division and Delegate from Goldstein HS in Brooklyn. The second resolution on two observations was not on behalf of an organization, but proposed by James Eterno MORE’s candidate for VP of High Schools and Delegate from Middle College High School in Queens. Be it further RESOLVED, that the UFT take visible and public steps to follow through on the resolution passed in May of 2016, and ask the Department of Education to immediately require that each school with immigrant students appoint an ‘Immigration Adviser’ (similar to the ‘sustainability coordinator’ or ‘anti-bullying liaison’) to ensure that schools and school processes are welcoming of immigrant students and families. Resolved, that the UFT will demand for 2017-18 and beyond 2 observations per year for most teachers. Michigan and Indiana are labs for what will happen nationally. Total free market in education. Education does not matter. Indiana has vouchers. Public schools left for special ed mostly in those two states. Parent leader and Board of Ed president from Michigan came to Albany. State went from top 20% to bottom 20%. Rural, suburban and urban all ruined. Cyberschools hurt too. Legislators need to know we are not talking about conspiracy theories. It is reality. DeVos coming to DC. She will more than likely be Education Secretary and she thinks education is just about making money. DeVos talking about people in schools needing guns because of possible grisly bears is a national joke. DeVos didn’t do well at confirmation hearing according to pundits. Talking point is to say something is fake news. Grassroots campaign highlighting public schools. Positive campaign needed for Albany. Not just NYC. Need people to stand up and fight for their public schools. Decent starting number for education. Governor now our friend. Asking him to protect public education. He says he will work to keep Millionaires tax. Money tight in Albany. Eva Moskowitz in Albany today pushing for more per pupil funding. Waiting to see if there is an opening on evaluations to keep moratorium on common core testing going. DeVos funded tuition tax credit to take money from public schools in NY. 900 chapter leaders showed up at evaluation training. We advocated for a fair system. Looking to phased in student learning measures. Make sensible changes. Tell principals: my kids learn, you lose. Not more observations. If we are working as teams, we would want intervisitations. Danielson now a dirty word. Need no new paperwork with intervisitations. 9 schools set to close this year or are consolidating. Does that mean renewal schools are failing? Politically dangerous to say schools are failing, particularly when other schools with same demographics are doing fine. DOE has to tell principals that principal autonomy is not working. One paperwork arbitration is because principal defied central paperwork committee. We are learning from field. Design something transferable from NYC to rest of country. Celebrate neighborhood public schools. Public wants strong neighborhood public schools. Champion public schools, honor student accomplishments. “Show your love for public schools” is the slogan. We need to talk about our classrooms, our students, and our school communities. Many ways to tell our story. Things like holding a showcase fair, or holding a school spirit rally, or making videos. Positive messaging. Sign up on UFT website, figure out what to do and then share story with UFT. Populate UFT website with activities and then spread it nationally. Inspire country. Mulgrew then showed an anti-DeVos commercial made by a chapter leader. 300,000 hits on video. Need to show friends and colleagues around the country how it is done. Resolution on public school proud was proposed. It passed unanimously. Leroy Barr gave a bunch of dates including next DA Feb 8. Questions on the save room, evaluations and more were asked. Nothing earth shattering in answers. Leroy Barr spoke against saying resolution was poorly worded. The motion received many votes but failed. Howie Schoor spoke against saying basically the new observation system is great. Fewer ineffective ratings now. My motion was voted down by Delegates. Mulgrew said for the record we pushed for two observations per year. A resolution opposing vouchers and one in opposition to DeVos both passed unanimously. Finally, a resolution to get a staff loung/cafeteria in every school passed. Michael Mulgrew—holds moment of silence for first year teacher in horrible traffic accident. National—speaks of attack campaign. Doesn’t know what to say about hearing. Asks if we brought guns to ward off grizzlies. DeVos doesn’t know much, particularly on special ed, but supports guns in schools. Says we must have fun with it or it’s depressing like Cathie Black with fangs and more money. Normally would report on state budget process, but must focus on DC. Said we would support people for both DC and NY marches. Buses to DC are full. Still don’t know where they can drop people off, believe it’s being done on purpose. Want more people at march than inauguration. Over 1,000 people with UFT on Saturday. Rally point 47 between 2 and 3. Will rally and march to Trump Tower. State—Said our strategy is build defense around our state and attack what happens in DC. In Albany I met with leaders to talk about possibilities for DC. Said we have research on Michigan and Indiana, bad situation, open market, no accountability, transparency, or regulations. Cannot close schools because they aren’t educating, only if they don’t make money. That is basis for state policy. Destroyed public school system except for special ed. Children are dollar amounts, special ed. students cost too much for voucher schools. Albany looking at business as usual, but we went back. We reached out to state of Michigan. We brought their people to Albany. Quite a few volunteered. We chose policy person and parent leader. We basically had a breakfast conversation with legislature. They told people that they first thought choice was a good idea. Four or five years later they realized it was market choice, not parent choice. Political money killed any chances of relief, schools are now among worst in country, privatizers got them all. Once they lost 15% in public school was tipping point and they started to fail. Cyber schools opened up and things got even worse. These are not conspiracy theories. Charters are just a tool to do what they want to do, to make education an open for-profit marketplace with no accountability. Person who pushed Michigan agenda will probably be next Secretary of Education. DeVos focused on making money, not educating kids. We will push transparency in Albany to keep them in line. Michigan rep said they didn’t know that what they were pushing wasn’t actually public education. NY must protect against such activity. Hearing last night—texts and emails all day about grizzly bears. Says technically one could come after a school. We will get cartoons about this. Last night we launched Thunderclap 1600 members and we need more. Reached many more. Tweeting during hearing was impressive. Pundits say she didn’t do well because staff didn’t prepare her, and unions made Democrats ask tough questions. This is work AFT has been doing for last month. Didn’t know it would be so easy. Didn’t think she wouldn’t know difference between growth and proficiency. Will probably just label it fake news, which they say about everything. We have to make a positive campaign, and it can’t just be NYC. We need to get people to stand up and fight, not just hope nothing bad happens. Stand up for your school. We have to push this. State budget—will be details we don’t like. Starting base for education not to bad, but not where we want it. Governor will be tested, as he’s being our friend right now. We will ask him to protect it. Glad he’s keeping millionaire’s tax. We pushed for that. We must support that. Are other revenue ideas. We need to see proposals from governor and legislature. Senate will have a lot of charter stuff. Eva had rally today. Heavy duty production. Will want space money and rent because she’s broke. Education—idea is to push through and make moratorium permanent. Right now they won’t focus, much infighting on governmental affairs. Lobby Day March 14th. Since last DA, new evaluation system. Heard it was end of world, but said it was alright. Amy Arundell and Jackie Bennet trained 800 CLs. How do you like matrix now? You love it. We didn’t get away with anything, but advocated for fair system. Student learning measures not nailed down, moving toward them that aren’t test based so we build in safety nets. People need to feel someone’s watching them. We don’t want change that will screw us or our kids. We need to know which changes make sense and which don’t. How did principals react? Bad day, just say matrix. My kids learn, you lose. There are not more observations. If you’re HE or E you have more choices for less. Intervisitation not observation. Will it be bad word later? We’ll see. To learn, better other people come in. Danielson equal to 4 letter word. Charlotte didn’t intend it this way. But we have to own this. Ask principal to work out intervisitation policy. No paperwork. We have 100 schools with resolved paperwork issues. You have to file. Chalkbeat wants to know if Renewal program is failure. Lots of people want to focus on failure. Why do some work and some don’t? We need a plan, everyone to understand it, we need to collaborate and move forward. Schools were losing 25% students, 60% staff, but other Renewal schools where people want to get in. Principal autonomy should be gone. We need teacher autonomy. We need to design and implement our lessons, but admin has right to say we want things differently. We need DOE to overlook admin when kids and staff leave. We don’t need this with DC environment. Paperwork committee directed principal to do something, and DOE won’t make her do it. We are in arbitration. Principals work for DOE. Positive campaign—#PublicSchoolProud 2017. Thanks team for work it’s done. Celebrating neighborhood schools. Honoring educators, students and parents. Want campaign transferable. Says people will express freedoms and creativity. We can get buttons, bumper stickers. People love neighborhood schools. That’s what public wants, except millionaires. We want strong neighborhood schools, accessible to all. Illustrate joys of teaching and learning. Bumper sticker—show your love for public schools. That is our vision. Asks us to talk about classrooms and kids. Talk about projects, how students inspire you, why teaching is important, and how you make a difference. Talk about our students, why they love their schools, how they’ve surmounted challenges. Says hands around schools photo gallery was thousands. Says nothing is written in stone, these ideas can change, we hope you will change them. Wants hearts to show why kids love school, school spirit rallies, videos. Get school community involved. Sign up for campaign on UFT website, discuss within school, share stories with UFT. Want to make this model for AFT, build grassroots groundswell up, get people off of floors where they are worrying about what will happen to them. Shows video—Attack on Devos, never spent time in classroom or taught, billionaire, not ed. experience or school admin, kids never went to public schools. Applause—video made by CL. People in Michigan said don’t let what happened her happen in NY. They influenced with simple messages, then used might and money and it was too late. 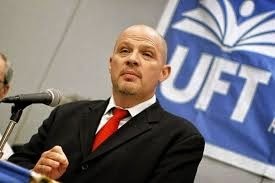 Says UFT goes all out in this campaign and shares across country to win this war. Calls for resolution. Moves to suspend rules. Passes. LeRoy Barr—Women’s March—buses full, waiting list. Emails on DC and NY tonight. UFT Black History Month, next month, three films. Chisolm, 13th, Rising from the Rails. Discussions to follow. Open to non-UFT. National school counseling week, February, Guidance counselors conference, High school awards, next DA February 8th. Mulgrew—Paras aren’t supposed to do lunchroom duty. Principal’s weekly says unless it’s on IEP that child needs para, lunchroom duty is off for paras, who get duty-free lunch. Retired teacher—HS often not neighborhood schools. need other phrase. Mulgrew—Most people believe HS neighborhood schools, will take under consideration. CL—I took teachers to PROSE seminar—PROSE doesn’t mean contract changes, but school is collaborative. If school has great idea DOE will let you try it. Why can’t everyone be collaborative? My principal is recovering dictator, now doesn’t send memo unless I’ve seen it. How do we get to point where we can talk that way about all principals? I’d leave if I worked in some schools. Mulgrew—political implications, more schools with improper leadership, no coffee cutter model. Good principals believe in respect. When that’s not case, principal shouldn’t be in position. We complain about how teachers are trained, but isolation is not cooperation, and doesn’t make good principal. We know difference between friction and bad management. As long as we need lawyers, system not being run properly. We should have good teachers rise through ranks. CL—What was your feeling in bipartisan reaction to Michigan people in Albany? Mulgrew—Was bipartisan audience. We asked folks from very small regions of state. They heard it because both parties always talk about public schools. Charters came from Democratic party. We realized there were bad players and educated folks. Bloomberg made people angry. Charter industry full of privateers. Dumped money into state races. Hope something good comes. Delegate—Evaluation system—best I’ve seen in 20 years was s and u, why can’t we go back. Mulgrew—principal had total control. Who wants to go back? I don’t believe in unfettered control based one whether principal likes you or not. People who had problems don’t like it. Since we started using new system fewer teachers rated badly. We can push back on morons who talk about testing. We are point A to point B, and now looking at growth. CL—Principal on record at safety meeting we don’t need SAVE room. NYS says all schools need them. Mulgrew—We will have people at your school. Principal doesn’t get to reject regulation. Must be plans around SAVE rooms. Implemented properly makes sure classroom process not impeded. Mike Schirtzer—MORE—For next month’s agenda—Resolution in support of immigrant New Yorkers. Body approved immigration liaison, for those of us with undocumented students, they will have rough day Friday, will get worse. These are our kids. You’ve seen students and family members at a loss, so this is personal. We want like Portland and SF, to lobby chancellor to do programs and discussions. Even radio uses term illegal immigrant, no such thing as illegal human being. Want to protect students and want DOE to protect student data. Want DOE campuses to be safe zones. We want to do all we can to protect students. LeRoy Barr—Rises to speak against. Over months have had conversations and voted to support our fight for immigrant students. Have already discussed immigrant liaisons in every school. Want to know what type of info we will give. Have done some of this. We have to be careful about words like every. Have implications. We will work with whoever brought this forward to find things we can agree upon but please vote down. James Eterno—MORE—Asks because state law mandates two observations, asks UFT demand 2 observations for most teachers. Teacher observation process broken beyond repair, used as scare tactic. People petrified of drive by observations with cookie cutter rubrics used to bludgeon teachers. Vast majority of us learn nothing from them and they are waste of time. Most NY teacher unions settled on 2 observation minimums. This year we went with four, Next year we should go with two, which will make teachers and sane admin happy. Argument is more makes them do their job, but reality is they get better at it. My wife has been under relentless attack but they learn and do better. Why give them that. We could just put in clause that 2 is minimum and more for teachers with particular needs. This would make them do it right. Also Friedrichs 2 is coming. Union dues won’t be mandatory. We can show our members we’re looking for what they want. Asks speaker against be someone who is evaluated under Danielson. Howie Schoor—You don’t get to pick who speaks against it. 2 is not mandate but minimum. We’ve been pretty successful. Before this we had 3% U. Was upheld. We don’t have that anymore because principals have to do some work. Fewer than 1% rated ineffective. We think this model even better because of the matrix. We will see at end of year or two. Urge you to vote no. Mulgrew—We tried to get two. Amendment—delegate adult ed.—Let’s also look for one room dedicated to adult ed. classes taught by adult ed. chapter teachers. Gregg Lundahl—These are two different things..
Mulgrew calls him out of order. Dave Pecoraro—not germane, and we need to extend debate. 6:02. Extends to end of reso. Mulgrew says he can rule it isn’t germane, and does. Point of order—Isn’t it true there is already an order from DOE that there is supposed to be a lounge for only teachers, but that cafe aspect is not a law from DOE? Mulgrew—don’t believe it’s true, will research, but cafe is not.